So we arrived at the Bethel Convention Centre in Birmingham to find a long queue of cars. This was different. We were bang on time, maybe even a little early and it looked like people had been queuing for a while! We’re more used to seeing a slow build up, but it appeared that the excitement for this event had squashed the usual “Black People Time” syndrome we’ve become accustomed to in attending events. Bethel Convention Centre is huge. Definitely designed to accommodate events of this nature. It’s clean and modern with all the facilities you would expect for a concert. You can tell that it’s predominately used for conferences and conventions but could easily be transformed into a live music concert hall, which is what the organisers, Rainbow Entertainment & Promotion did. On arrival, we were welcomed graciously by ushers and there was a good number of them on hand to manage the crowd. They were very professional and friendly. We like that. There was certainly an atmosphere of anticipation and excitement. And when we say the place was jammed packed, we mean JAMMED PACKED! People had travelled from across the country to sunny “Brum Land”. It was a sold-out event, which was awesome to see and be part of. However, a mix up of tickets with a number of seats being double booked and poor organisation around the whole ticketing and seating arrangements had left some people feeling quite disgruntled, unfortunately. But if we know anything about the UK’s leading Christian event organisers, Rainbow Entertainment & Promotions will quickly learn from this, put the necessary structures in place and move on to the next hot event. They’ve got it like that. Ok, on to the actual concert. The show kicked off with Living Waters Choir, a youth choir based in Birmingham with grown folk confidence. These kids had exuberance in its bucket load. They absolutely set the show off by putting their own stamp on the songs we know and love such as church fave “Awesome God” and the popular Mali Music song “Beautiful”. Other ministers on the night included South London worshipper Jacy Mai, Midlands-based group The Projects and vocalist Sandra Godley. All who played a huge part in setting the atmosphere before the man himself took to the stage. One thing we appreciated about this event is that the wait for the main artist was long enough to build anticipation but not so long that you started to get frustrated. We think the organisers found the perfect balance concerning the number of special guests and the length of time they were given to minister. Now, let’s get to the nitty gritty. How was William McDowell’s ministration? Well, we’re surprised you even had to ask! This Gospel superstar came on stage as humbly as he possibly could and just did what he does best — worship. There were no airs and graces about this performance. No particular “wow” moments. No hype building or crowd stirring, just straight worship. In fact, it was probably the simplicity of the ministration that allowed people to connect to the presence of God so quickly and easily. He sang songs we’ve been singing in church and that have been bringing us to a place of surrender. 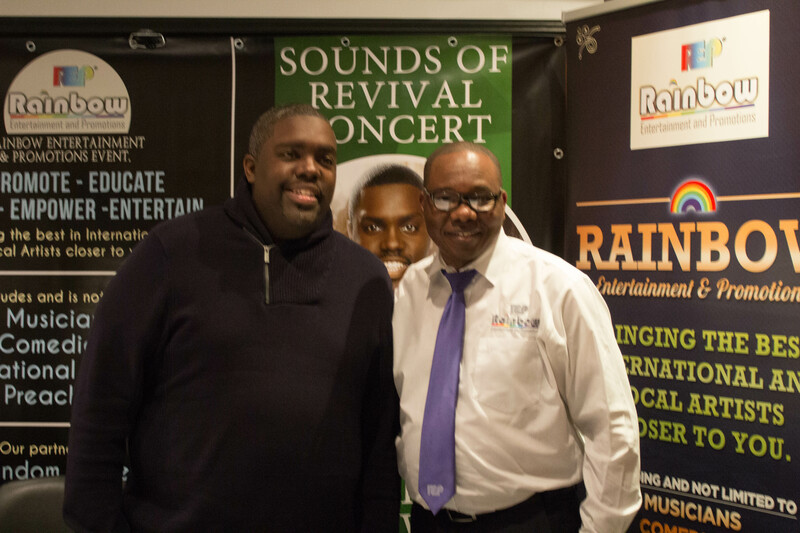 He touched on the golden oldies that we love from him like “I Give Myself Away” and “You Are God Alone”, instead opting to minister more from his most recent album “Sounds Of Revival”. Songs like “Spirit Break Out”, “Don’t Mind Waiting” and “Send the Rain” had us all lost! Most people we spoke to were just in awe of the ministration from McDowell and were moved by the anointing that he carries. A small handful of people felt that it was little too much like the CD and wanted to hear something fresh, a little different and a little less rehearsed. As for us, we were supposed to be working, taking pictures and making notes for this review…but instead, we spent most of the time screaming “yes Lord”, hands in the air, jumping up and down, or in a mess with tears streaming down our faces. In our books, that makes for a fantastic performance and ministration. Talking about his most recent album William McDowell took the audience by surprise when he announced that his second album, a sequential project simply entitled “Sounds of Revival 2” was available to purchase on that very night and that they would be the first people to get their hands on the record. Nice! And the surprises didn’t stop there. He went further to get us all excited when he indicated the possibility of recording his next live project in the UK. Nice x 2!!! So was it a great event YES! Great atmosphere? YES! Value for money? Absolutely! What’s the next big event? 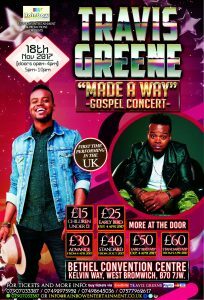 Well, Travis Greene is heading to Birmingham later on this year courtesy of Rainbow Entertainment & Promotion so be sure to get your tickets for that. And if the William McDowell event is anything to by, we’d advise that you get your ticket sooner rather than later…no “last minute dot com” behaviour otherwise you may be left having to read the review afterwards.